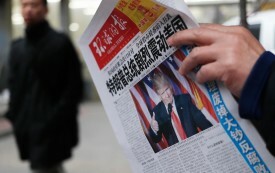 Was Trump’s Taiwan ‘Gaffe’ Really All That Bad? There are extremely legitimate reasons to be fearful of the president-elect’s foreign policy. Is taking a call from Taiwan one of them? Several years ago, the editor of Business Ethics magazine published a blueprint for a new, more humane economy. There has never been a better time to put her visionary plan into action. If the United States can abandon the idea of a "war" on terror in favor of a comprehensive and equitable collective response, we may have a shot at stopping the right from destroying the nation in order to save it. High levels of uncertainty, poor management and an $800 billion expenditure on a venture that has put America's brand at risk all conspire to make the Street pretty skittish about Iraq.